Making everyday trips fuss-free, the Armadillo pushchair is compact without compromise and comes in black jack. Save space with the clever folding system. 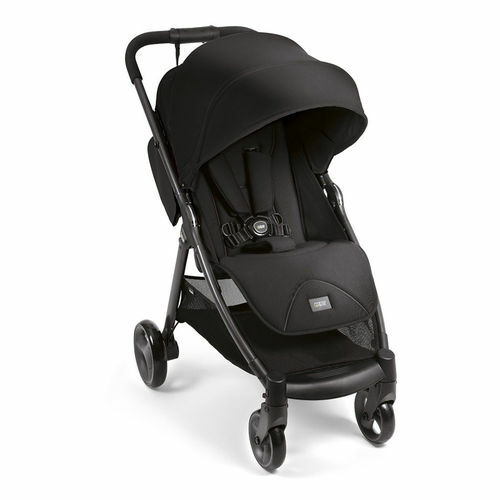 Its convenient compact fold holds an extra-spacious seat to keep baby comfortable. With the pushchair?s compact fold, easily store it away at home or take it with you on the go. It can be folded using 1 hand for maximum ease. Lockable wheels ensure safer steering for your peace of mind. Your little one enjoys a spacious seat with an adjustable footrest to stretch out. A lie-flat position lets them sleep naturally. The large UPF 50+ hood protects against harmful sun rays and rainy days and has a magnetic window to check on baby. A built-in shopping basket and cup holder keep essentials close by without taking the focus away from your new arrival. Pushchair measures H:99cm x W:55cm x L:95cm approx. Folded measures H:68cm x W:55cm x L:50cm approx.